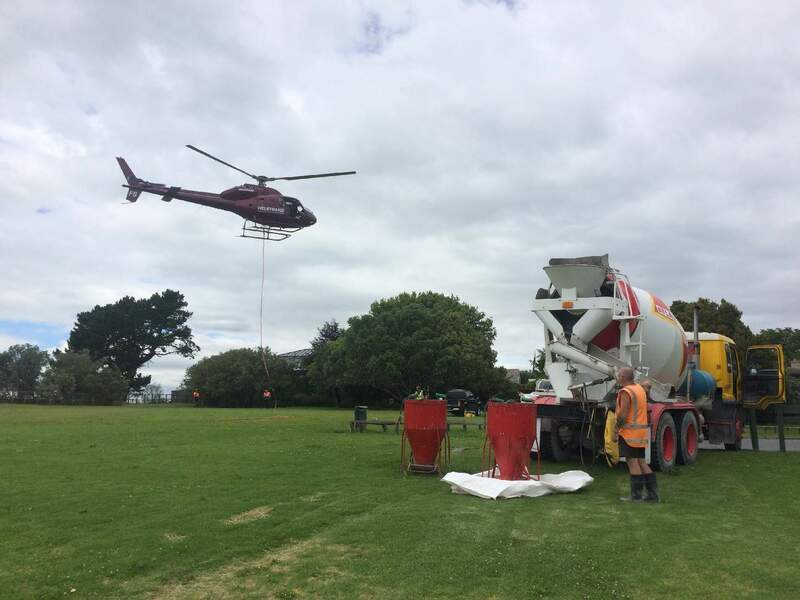 Atlas Concrete Delivered to Site by Helicopter! There are often challenges getting concrete to sites with limited access, but what do you do when it’s too far to pump and too steep to wheelbarrow? Call in a chopper! One of our clients had the difficult task of building a new stairway beach access from the top of the steep cliffs in between St Leonard’s Bay and Narrow Neck Beach on Auckland’s North Shore. Field Drainage Specialists NZ Ltd employed the assistance of Heletranz to chopper in the materials, including the concrete for the piles and a small pad at beach level. Atlas supplied a special mix containing micro-silica to prevent salt water penetrating the concrete and rusting the re-enforcing steel. This mix was delivered to a lookout area on the cliff top where it was transferred into a skip, which was then attached by a long cable to a Helicopter and flown down to the beach. The guys from Field Drainage Specialists, Atlas Concrete and Heletranz, positioned cliff top, in the air and down on the beach ensured a quick turn around and were able to send around 10 skip loads down to the beach to complete the job without any hiccups. Spring Cleaning! Atlas now stocking Green Gorilla Waste Bags!